– Save Your time and effort. 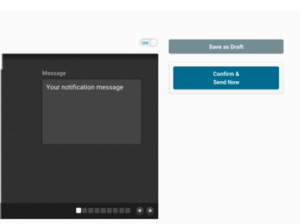 – Manage the notifications easily. 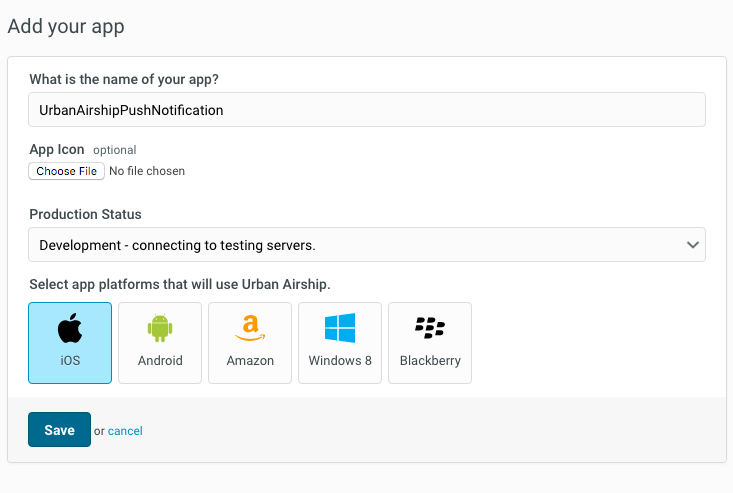 This section will explain some simple steps to be followed to send push notification to iOS platform via Urban airship dashboard. The steps are given below. 3. Set up your xcode project. You need to create an account in Urban Airship using an email id and password. There are many pricing plans available. Select a pricing plan or select a free starter account. Click here to view the available account plans. After the successful registration, click manage your apps from Urban Airship dashboard to get started. After the registration is completed, add your first app. You need to specify the following details to create an app. The name of your app. You must select whether your app is in development mode or production mode. When you are setting up development and production apps, you have to configure them for push services. See the APNS Setup documentation for detailed instructions. Select your platform here. The available platforms are iOS, Android, Windows, Blackberry etc. After selecting the iOS app platform, save your app. You have created an app in previous section. Then you need to set up the xcode project. First, create an xcode project for push notification. Then you have to follow some steps to set up your project. The steps are explained below. Download the latest version of libUAirship from Urban Airship. Unzip the SDK and add the libUAirship static library and headers into your project. Click here to download the latest version of Urban Airship SDK. In the project’s build settings set “Enable Modules” field to “Yes” and “Link Frameworks Automatically ” to “Yes”. The SDK can be included using the Urban Airship static library(iOS 7+) and Urban Airship Embedded framework(iOS 8+). The static library and embedded framework have different setup procedures. Add Airshipkit.XcodeProj into your app project in xcode. Add the Airshipkit.framework file to the Embedded binaries section in the general tab for your project to link against the embedded framework. Ensure that your project’s header search paths under build settings include the Airship directory. Add –objC –lz –lsqlite3 linker flag to prevent “Selector Not Recognized” runtime exceptions and to include linkage to libz and libsqlite3. The linker flag –force_load<path to library>/ libUAirship<version.a> may be used in instances where using the –objC linker flag is undesirable. In the libraries section in the Build Phases, add the libUAirship.a file to the link binary to link against the static library. Add the UrbanAirshipResources.Bundle file to the Copy Bundle Resources section in the Build Phases tab for your target. You can enable Background notification by enabling Remote notifications of Background mode under the target’s capabilities section. To manage your production and development application profiles, the Urban Airship SDK uses a .plist configuration file named AirshipConfig.plist. You can create two application within your Urban Airship account:one for development and one for production. Create an AirshipConfig.plist and set the following values in your .plist file. Import the AirshipKit header files to your application delegate. You must import the individual headers if your application uses the static library. Inside your application delegate’s application:didFinishLaunchingWithOptions:method,initialize a shared Uairship instance by calling Uairship takeoff.This will bootstrap the Airship SDK. 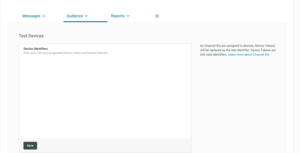 The channel ID is a unique identifier used to target pushes to a specific devices using the Urban Airship API.You can always get the channel ID using the following code. 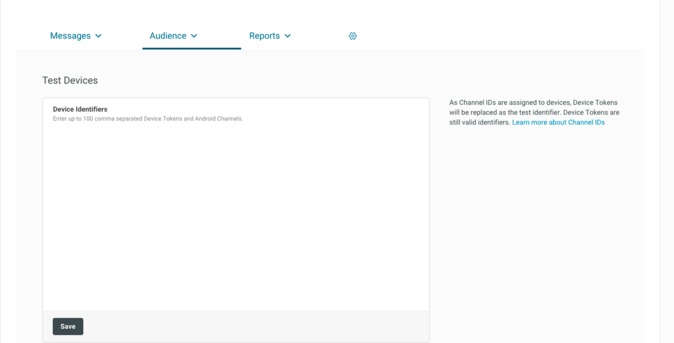 ChannelID initially comes back as NULL on your apps first run.It will be created and persisted during registration. By default User notifications are disabled.To enable notification write the following code. 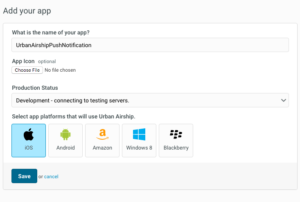 Set the user notification types on [Uairship push]. Sounds, alerts and badges are the default types. The library will register to receive notification after the user push notifications are enabled. You need to add a list of test devices in Urban airship console before sending your first notification. To setting up test devices, select Audience. You can see a text box for entering list of device identifiers. You can enter up to 100 device identifier here. After entering the device identifiers save the list. segments are groups of audience that you can create using combinations of location,tags and lists. Test devices are predefined devices created by an account administrator. Select an audience from the list. Then navigate to the delivery section and you can see two options here. If all has been set up correctly,click Confirm and Send Now. You have sent your first push notification!!! Stumbled upon Mobile shell (Mosh) which allows persistent connection over intermittent connections, VPN – WiFi – networking roaming etc. Its quite useful especially when we have tons of nodes across multiple cloud providers & resulting attempts of their attention grabbing. Automating few things in a CRM made us end up setting up a Postfix mail server after something like more than a decade, got frustrated over the nearly non-existent internet provided by Asianet DSL & all credit of this goes to them. TL;DR Here is a quick guide to get Mosh working on Mac & GNU/Linux flavours. Mosh uses UDP. Yes, you heard it right. By default it uses 60000 to 61000 for establishing connections. We would need to open up some of these ports, say a subset of this in the fire wall mechanism that we use to get access to the servers. Open up few UDP ports in the security groups. We opened up 10 ports. On DigitalOcean or any other provider open the ports in your firewall. Died at /usr/local/bin/mosh line 201. Another issue we ran into was the locale & UTF-8 encoding. We fixed it by installing the locale in the client and server and exporting the following environment variable to the bash profile. You load the environment variables by doing the following in bash. It may not work just yet as you may have to deal with NAT traversal and other nasty things. Creating an SSH tunnel can solve these issues. Reattaching a detached Mosh:mobile-shell is not possible. But we can run screen inside mobile shell. PS: if you use CIRU.org, things may be different for you. That’s it. DigitalOcean guys have come up with a nice write up here which is very helpful. There is also an Android client and iOS client in the making. On GNU/Linux I use KDE Konsole & on Mac iTerm : these are 2 good tools that are very useful IMHO. 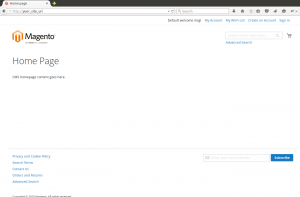 Installing magento2 in Ubuntu 14.04 with Nginx web server. Create basic nginx configuration file for magento2. Change the directory where to download and install Magento2. Here you will get your Language, Currency and Time zone using the following magento command. Once the installation is completed you will get the SUCCESS message at the end of installation. 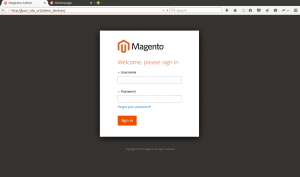 You can access the magento admin interface using the random generated URL while installing Magento2. 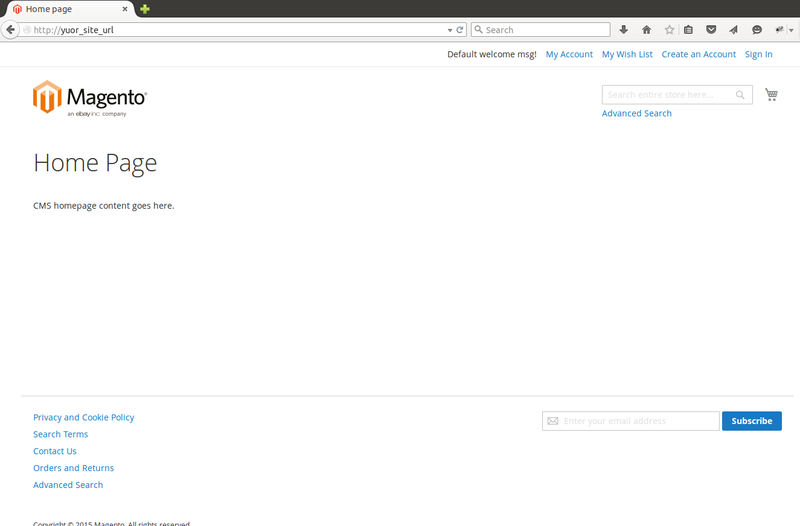 You can check the URL using magento command line. You can change the the Admin URI in <your Magento install dir>/app/etc/env.php. You can access the magento2 home page at the installed URL as http://yuor_site_url. We have came across the following error quite a few times. Though it may sound tricky, the error can be quickly fixed by installing missing PHP libraries. This often happens because of the upgrades. Don’t forget to restart Apache / Nginx or the relevant web server to load the libraries / modules. We have been using plenty of different tools for tracking bugs/product management/project management/to do lists/code review; such as ClearCase, ClearQuest, Bugzilla, Github, Asana, Pivotal Tracker, Google Drive etc. We found Phabricator as a “Too Good To Be True” software engineering web application platform originally developed at Facebook. It has code review, wiki, repository browsing,tickets and a lot more to make Phab more fabulous. 4. Enable the virtual host entry for phabricator. 3. Edit the repository.default-local-path key to the new local repository directory. Phabricator uses as many as three user accounts. These are system user accounts on the machine Phabricator runs on, not Phabricator user accounts. Since we are going to enable SSH access to the repository, ensure the following holds good. – Open /etc/shadow and find the line for vcs-user, git. The second field (which is the password field) must not be set to !!. This value will prevent login. If it is set to ! !, edit it and set it to NP (“no password”) instead. – Open /etc/passwd and find the line for the vcs-user, git. The last field (which is the login shell) must be set to a real shell. If it is set to something like /bin/false, then sshd will not be able to execute commands. Instead, you should set it to a real shell, like /bin/sh. We will move the normal sshd daemon to another port, say 222. We will use this port to get a normal login shell. We will run highly restrictive sshd on port 22 managed by Phabricator. – make a backup of sshd_config before making any changes. – Update /etc/ssh/sshd_config, change the port to some othert port like 222. We now configure and start a second SSHD instance which will run on port 22. This instance will use special locked down configuration that uses Phabricator to handle the authentication and command execution. # NOTE: Replace this with the username that you expect users to connect with. # NOTE: Replace this with the path to your Phabricator directory. Add this entry to the /etc/rc.local to start the daemon on startup. You should now be able to access your instance over ssh on port 222 for normal login and administrative purposes. Phabricator SSHD runs on port 22 to handle authentication and command execution. – Run git pull in libphutil/, arcanist/, and phabricator. – Restart the web server.